Patrick is an author and member of the Written Remains Writers Guild. 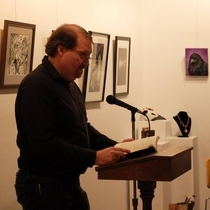 He writes speculative historical fiction as well as contributing to the All Out Monster Revolt magazine. While not writing, he spends time with his lovely wife planning the return trip to Dublin that inspired his piece, The Black Dog of Cabra. Patrick's story, "The Black Dog of Cabra," was published in A Plague of Shadows: A Written Remains Anthology.